This is the time of year when we eagerly await the arrival of spring. It has been a long winter and especially harsh in many parts of the country. My family in Florida even saw snow this year! I was happy to find a card in the box that could offer some support while we wait for March to transform from lion to lamb: Cream Soup. Not only is this recipe a delicious and soothing comfort food, but it’s easy to make and even easier to prepare in a healthy way. I used low-fat, low-sodium versions of the soup and chose skim for the three cans of milk. I’m not a big fan of celery and onions so I substituted lightly sautéed baby portabella mushrooms instead. I also used turkey bacon. I’m not a huge fan of it because it doesn’t cook right, but it was a small amount so I guess it was O.K. Next time though, I’m just going to use real bacon. And finally, I added some extra chicken (I used a rotisserie chicken) because there wasn't much in the can of chicken rice soup. 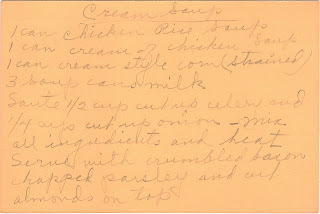 Even with the skim milk, the soup was a nice, thick consistency (I think the creamed corn helped with that). I recommend toasting the almonds before sprinkling them on top as a finishing touch. And with just my husband and me at home, it was plenty for two meals each and then enough to freeze to bring out again in a few weeks. Hopefully by then, the snow piles will be drastically reduced and all the toys Murphy left out in the yard before the first snowfall in December will begin to reappear.